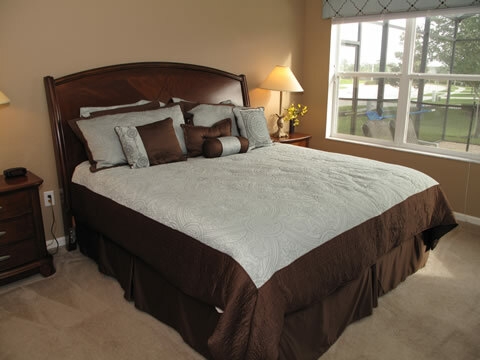 A large King sized bed with a pillow top mattress covered by 650 TC sheets. 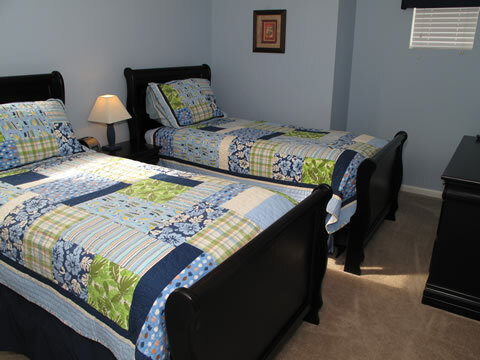 This bedroom has a 24 inch wall mounted flatscreen TV, IPod clock radio and a ceiling fan. A double bowl sink allows for 2 people to easily get ready for the day. 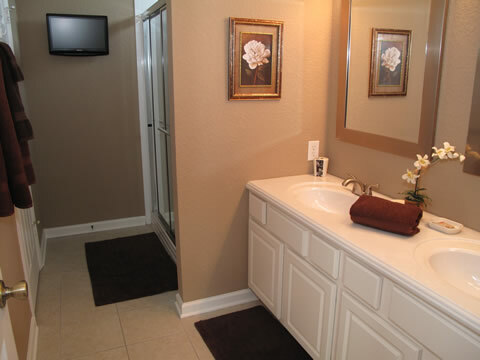 There is a wall mounted flat screen TV in the bathroom visable from the large 3x6 shower. This room also has a private enclosed room with toilet and also a huge 8x8 walk in closet. 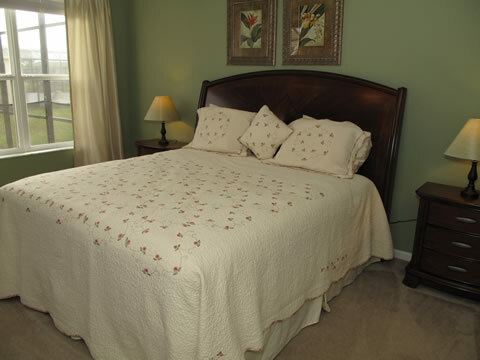 MASTER 2 FIRST FLOOR - SAGE GREEN A large King sized bed with a pillow top mattress covered by 650 TC sheets. 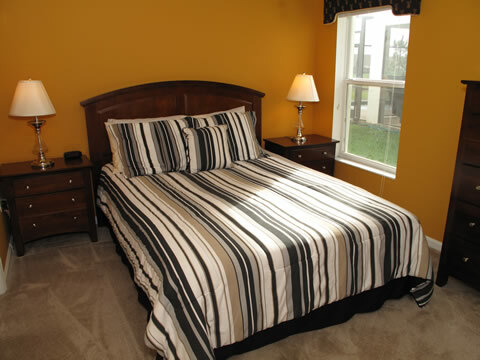 This bedroom has a 24 inch wall mounted flatscreen TV, IPod clock radio and a ceiling fan. MASTER 2 BATHROOM A double bowl sink allows for 2 people to easily get ready for the day. There is a wall mounted flat screen TV in the bathroom visable from the large 3x6 shower. This room also has a private enclosed room with toilet and also a huge 8x8 walk in closet. A lovely queen size pillowtop mattress is inviting in this bedroom. There is a flat screen TV/DVD, IPod clock radio and ceiling fan also. The ensuite bathroom offer a tub/shower unit with an entrance from the bedroom and hall. 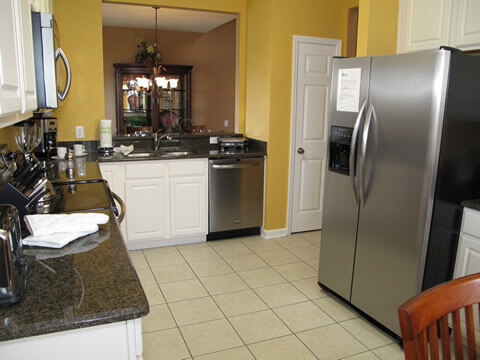 Granite countertops and stainless steel appliances are the highlight of this remodeled kitchen. There is a large pub style table with seating for eight. In addittion to all the cookware needed there is a wall mounted flat screen TV. Plenty of cups/plate/utensils. Even plastic ones for safe use out by the pool. Located just off the kitchen and family room with a large table with seating for 10. New leather sofa and loveseat offer great comfort and excellent viewing of the 52 inch flat screen TV. There is also a ceiling fan with a remote control for comfort. There is a full size pool table, air hockey table, foosball table, TV, PS2 game system, pull out sofa, and 4 sets of golf clubs for your use. There is also a full size washer and dryer in this room. This room has 2 twin beds with white furniture, a wall mounted flat screen TV/DVD, IPod clock radio, ceiling fan along with a ensuite bathroom. This room has 2 twin beds with black furniture, a wall mounted flat screen TV/DVD, IPod clock radio, ceiling fan along with a ensuite bathroom. Large pool with a separate spa/hot tub. 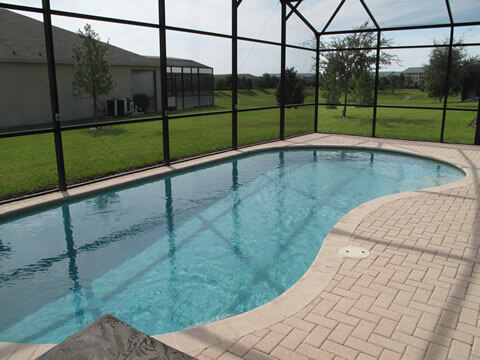 This is a jetted hot tubs which has a heater which allows the temperature to be adjusted up to 106 degrees. There is a 5 burner BBQ for your use as well as a table with seating for 10. 4 Large comfortable loungers completed the patio area. 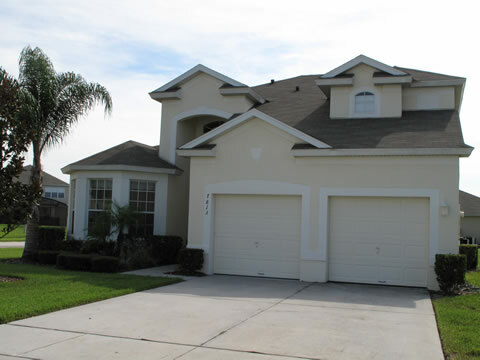 •The closest resort (of it's type) to Walt Disney World - just 1.5 miles from Disney property. •Close to our world class shopping outlets and other local attractions such as Old Town, the Mall at Millennia, the Florida Mall, International Drive and MUCH MUCH MORE !!! Our family of 13 all enjoyed their stay at this ideal home away from home. The 7 children had a great time in the heated pool and spent many evening hours in the game room. The kitchen was well supplied with every utensil ever made by man (or woman :) We would return without hesitation.